"How are we gonna fight a Treant?" In the event that we don't have a full party for our larger campaigns, Elijah Dave and myself have each designed a small campaign to fill in the gaps. Now I normally don't do a game write up for this sort of "filler" campaign, but the brutal saga of how Dave and I managed to clobber our way through the Minotaurs Dungeon is too epic a tale to keep silent about. Elijah's "Filler" campaign is called the Maze of the Minotaur. And truth be told he came up with the entire concept, with only a word from Dave that a Minotaur's Maze would be cool, and forty minutes to prepare. What he created was a wonderfully simply back-story, and great Dungeon for us to run through. 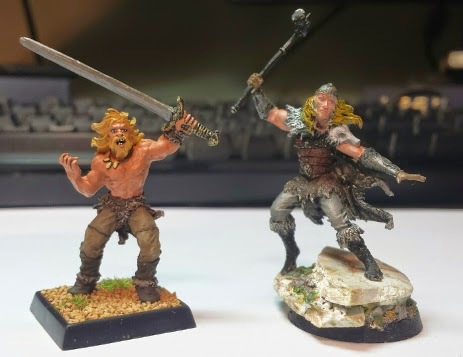 The King of the land had called for it's two greatest warriors, the Barbarian brothers Raymond (Dave) and Robert E. Howard (Andrew). Given that we were level 4, the caliber of warrior in the land would seem to be some what wanting. Apparently, the Minotaur in the Cities Maze had grown so powerful that no champion stood a chance of defeating it. It was up to us to slay the beast, and find the three keys that would let us exit the maze. 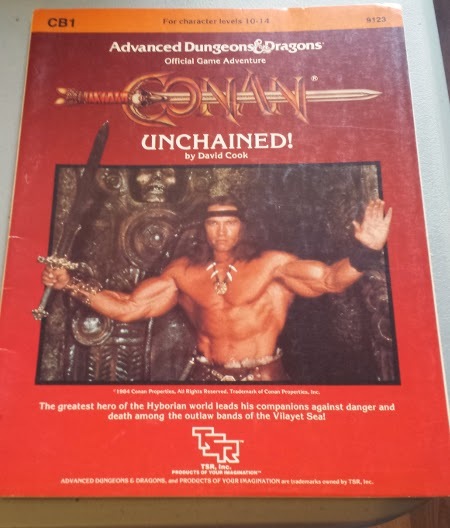 To give us a hand in our difficult quest, Elijah decided that he would implement the health rules for the 1st ed AD&D module Conan: Unchained. They work as follows. Every time the players rest, even if only for a few minutes, they gain 1 hit point. If the players get a full night sleep they gain half their constitution back in hit points. It meant that finding a safe spot to rest would mean the difference between life and death. To help us further, Elijah also rewarded us a ball of magic thread similar to the one given to Theseus by Ariadne in the traditional Greek epic. Feeling this was evil magic, Robert threw the ball of string on the ground. And Raymond spit on it. Scene 1 Enter the Dungeon. The two brothers stood at the entrance to the Minotaur's Maze. The musty smell and the darkness of the labyrinth held the pair in but a moments hesitation before they plunged into the depths. The walls were smooth with age, the ground was rough with loose sand and stones. Above them, they knew a crowd was watching with great anticipation; their viewing enhanced through the aid of ancient magics. The Maze was an arena, and the spectators were waiting to be entertained. Before long the Barbarians reached a fork in the tunnels. One path lead to the left, the other lead to the right. Robert looked at his brother Raymond, hoping to see some sign of where to go next. "We go right." Raymond said. Following his brother's lead, Robert dashed off after Raymond as he ran down the corridor. The passage twisted and turned, until finally stop before a large wooden door. Scene 2 Running from the Grick. The portal didn't seem to be trapped, and Raymond pushed the door open with his heavy hand. It opened with ease, swinging silently on well oiled hinges. 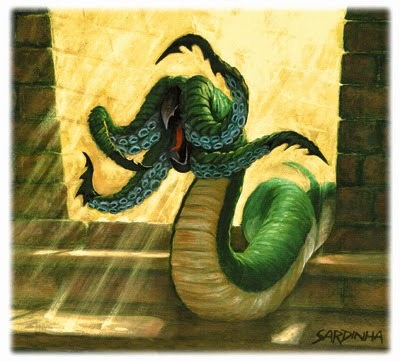 The room was well lit, and in the center, coiled around a pillar was a huge worm covered in tentacles. Raymond immediately recognized it as a Grick. The grotesque nature of the beast stunned the two barbarians, whose fear of the unknown got the better of them. Robert yelled to his brother "Run!" And wasting no time he slammed the door shut as the Grick lunged at them. The door closed just in time, and the great bulk of the creature slammed against it, shaking it on its hinges. Not wanting to wait around and see if the door would hold, the brothers ran as quickly as they could back to the fork. This time they would go left. The passage to the left ended abruptly in a small chamber with two doors; one straight ahead of the brothers and one to the right. "Forward!" Raymond cried, and the brothers burst through the door. Inside they saw a small chest guarded by three winged-lizards. The two had never encountered anything like the monsters, but being not nearly as threatening as the Grick, the two charged in the room, their battle cries echoing down the corridor. 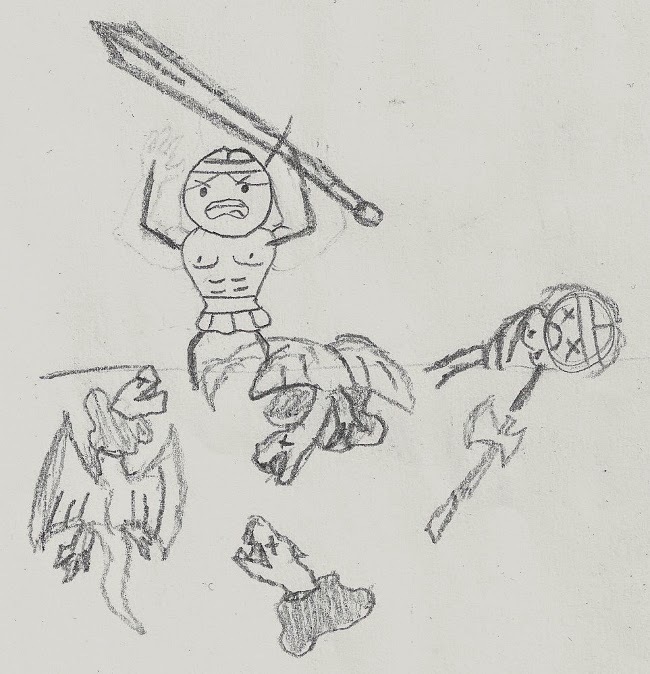 Robert swung his great sword, scoring a critical hit, and splattering one of the pseudo-dragons brains across the room. But Raymond was not so lucky. His first attack hit, and two of the monsters leaped at him, biting deep into his flesh. Raymond almost cried out, but the poison from creatures fangs paralyzed him and he fell to the floor, where he lay motionless for the rest of the fight. Robert stuck his great sword into the corpse of the first pseudo-dragon, and grabbed the injured one. It snapped at his face, trying to sink its venomous fangs into the exposed flesh, but his strength over came it and he broke the beast's neck over his knee. Flinging the dead creature aside, he then grabbed his great sword and spun to strike the last pseudo-dragon. Another critical decapitated the beast, and Robert let out a mighty Cry of Victory. The Chest contained three Cure Lights Wounds potions, one of which Robert poured down Raymond's throat. He then put one of the potions in his belt, and the other in Raymond's and waited for the poison to run it's course. After Raymond awoke, Robert informed him that this room was a dead end. So they went back into the hall and rested by the door to the right; mentally preparing themselves for the challenges that lay ahead. Scene 4 Battle with the Dryder. The First Key. After five minutes rest, the two searched the door to the right for traps, found none, and entered. The long tunnel that extended ahead of them, was darker then the rest of the tunnels, and the two stopped just short of the entrance to listen. A chittering sound was coming from the ceiling. Looking up, the two a horror beyond belief: a spider with the head of man. The Dryder climbed down from the ceiling, and the brother stood there in shock as it lunged at them, pouncing on Raymond. After a brief struggle, Robert managed to pull the creature off of Raymond who in one fluid motion rolled into a swing with his axe. Another critical hit split the monster's thorax killing the Dryder. In victory the two howled, until their celebration was cut short by the sound of a thunderous menacing laugh for the depths of the Maze. The Minotaur was close. Searching the Dryder revealed the first key the two required to leave the maze, which Raymond put around his neck. Leaving the stinking corpse of the dead Dryder, the two made it down the hall finding another door. Their keen sense detected a trap, which they braced themselves for. The door opened, and 3 arrows came shooting out. One struck Robert, but he pulled it out and continued on. 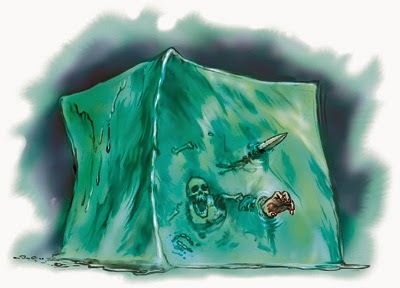 Scene 5 The Gelatinous Cube. The Second Key. After winding through the maze for another hour. The pair finally came to another door. Robert tried to push through it only to find it stuck, but thankfully Raymond knew better. He pushed Robert aside and pulled the door open. Inside sat a jiggling cube of ooze. It was full of bones, and what seemed to be most of a slave, still being digested. Horrified into a rage, the two rushed at the cube swing their blades, hacking it to pieces. But much to their surprise, the cube lurched forward, knocking Robert from his feet and scalding him with acid, pocking his skin with burns. He let out a great howl in agony. Furiously Raymond kept hacking at the creature until all that was left was a quivering mass. Behind the remains of the cube, lay a door, and just behind it lay the second key. Raymond added it to his necklace. Feeling the sting of the acid on both of their bodies, the brothers downed their Cure Light Wounds potions, but what they really needed was a safe place to sleep. Deciding to push on, the brothers opened the door behind the cube and walked through. As they entered the next section of the maze, an iron gate feel on the door behind them, grazing Raymond's back. He growled more in annoyance then in pain. Scene 6 The Bridge. The Minotaur. The Stand Off. Before them lay a rickety wooden bridge the extended over a deep chasm, leading to more chambers on the other side. It was as good a place as any, and the two hunkered down for some rest. Some hours later they were awakened by the Minotaur's laugh. It was close. The barbarians crossed the wooden bridge one by one, it swayed and creaked beneath their feet. When they reached the other side they found another long hall with a door to the right. The sound of hooves clattered against the stones behind the door, and it reverberated with a great thump. The minotaur laughed again; It was behind the door. The beast continued to hurl its weight against the door, and the wood began to splinter. It was at this point that Robert had a "do or die" idea. He shouted to his brother to run to the other side of the bridge. There they would make their stand, with their blades on the ropes; daring the Minotaur to cross. And so there they stood; sweat dripping from their brows, the pound of the Minotaur's weight against the door, ringing in their ears. The door erupted into splinters and kindling as the minotaur smashed his way through. As quick as lightning he dodged the arrows from the trap he set off, checked the room for only a moment and then headed towards the barbarians and the bridge. Raymond saw the glint of the third key around the Minotaur's neck. Slaying the beast would be the only way out. On thick legs and heavy hooves the minotaur slowly approached the edge of the chasm. It laughed taunting the men, but the Barbarians did not waver. If the beast began to cross they would cut the ropes sending it pummeling to it's doom. Their freedom be damned. Robert's plan was to wait out the beast until they could find a better way of killing it. It worked! The two waited so long, they gained back 2 hit points, and the Minotaur roared in anger and stormed off the way it came. Robert and Raymond held their stance on the bridge of another hour, just to make sure it wasn't bluffing. Now it was their turn to be the Hunters. Scene 7 Dire Weasels in the Dark. The Kind Treant. The room the Minotaur had come from was dark, and neither of the two could see far inside of it. Cautiously they entered with Raymond leading the way. A hissing sound issued from the darkness and two dire weasels charged them. With a swing from axe and sword, the beasts were sent to their graves. They were no match for such warriors. The two lost the tracks of the Minotaur fairly quickly and found themselves running around the tunnels for hours. They opened the first door they came to, hoping for another place to rest, only to find a grand chamber. In the center stood a great magical tree. Robert and Raymond stood stunned. This was after all the first thing that had actually spoken to them all game. The Treant told them that they could rest here, and that was when Robert had another stroke of brilliance. He told the tree that the Minotaur had grown too powerful, and would eventually destroy the city. No one was safe, not even a powerful Treant. He then asked if the Treant would help them slay the minotaur. He rolled a 20 on the diplomacy roll. Before the Treant could answer Raymond start yelling to the minotaur at the top of his lungs; claiming that the Treant had slandered his mother. 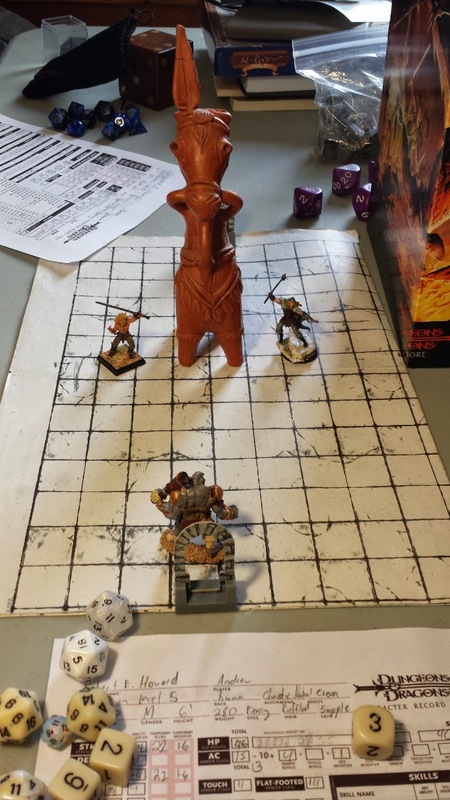 Robert got into the jeering, and before the the Treant knew what was happening The minotaur burst into the room. His Nostrils were flaring, and gripped in his powerful hands was a great axe. Then the Treant began to scream. So we didn't have a Minotaur... or a Treant. Go Ogre and Clay Donkey! Scene 8 The Fall of the Minotaur. Robert and Raymond stood by their Treant friend trying to encourage it, but it's fear of the Minotaur and its axe was too great. With a battle cry, Robert charged at the Minotaur trying to grab the axe out of his hands. However the Beast was too strong and with a shrug it sent him flying across the room. Robert landed with a thump, his great sword flying from its place on his back. The Minotaur then charged at the Treant and with a mighty swing almost cut it from its trunk. Raymond attacked the minotaur from its right, hitting the creature with his great axe, but he only caused a light wound. The Treant, shocked, cried out in pain; stunned for the round. Robert Stood up from the ground and searched for his Great Sword. He found it sticking into the soil not far from him, and grabbed it. He turned on his heel, and bore witness to his brother's peril, and then the greatest strike of the evening. With a great blow the Minotaur's axe slashed into Raymond knocking him to the ground. Raymond then threw his axe at the minotaur, slashing the creatures shoulders. But none of this compared to the rage of the Treant. With a cry that shook the earth, the Treant swung it's branches at the Minotaur knocking him to the crowd and causing a critical hit. The Minotaur was driven down into the ground, the earth erupting into a small crater. The Minotaur was still not dead, but that would be rectified. Robert then came from behind and finished the creature with a blow from his great sword, cutting deep into it's body. With a gurgle, the Minotaur fell limp and its corpse collapsed to the ground. The two brothers cried out in victory! The Minotaur was dead! But the day was not won without sacrifice. Turning to their Treant friend, the brothers saw it was dying. The energy it had put into the blow against the minotaur had caused it to snap from its branches. Before is passed on, Raymond asked if the Tree had any seeds they could may spread in the world above, to honour its sacrifice. The tree smiled and reached into its branches giving him a bag of Treant seeds. With that final gesture kind Creature died, its trunk cracked at the base and the top fell to the ground. It was a solemn moment. After the death of the Treant, the Barbarians found themselves incredibly hungry. It had been almost two days since either of them had eaten, and it appeared they had only one source of food: dead Minotaur. 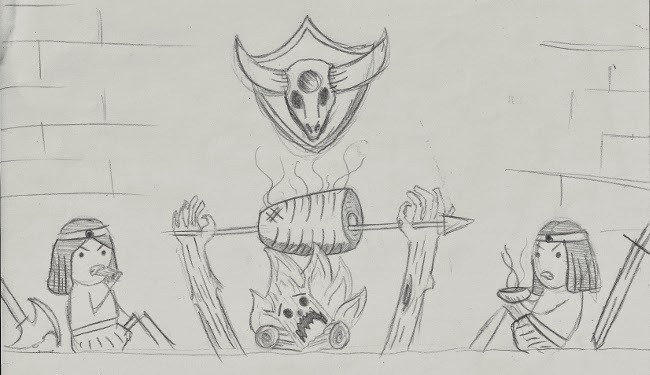 So Robert and Raymond set about chopping up the dead Treant for fire wood and then proceeded to roast the dead minotaur on a spit above the flames. While they waited, Robert, who was skilled in making bowls out of skulls, used the top part of the Minotaur's skull to create a well made skull bowl, which he kept with him as a memento. And thus began the most Metal feast in all history. After their grand meal the two slept deeply, knowing the smell of cooking Minotaur would be enough to scare any creature away. Scene 10 Escaping the Labyrinth. The next morning they awoke feeling refreshed and began to explore the maze, seeking the exit. At one of the dead ends they encountered another Dryder, which grabbed Robert and began spinning a web around him. But, as Raymond hacked at the creatures leg's with his Axe, Robert squeezed the monster's head until it crushed beneath his hands. Leaving the dead end, the brothers explored the Labyrinth until finally discovering a room with a door, that had three key holes. there was only one problem. It was guarded by a Grick. The two barbarians worked themselves into a rage and charged the beast, killing it in mere moments. Raymond then took his keys, and placed them into the locks, opening the door and releasing them from the maze. A crowd of cheering onlookers gathered, and the two stood there; arms raised in victory. After the game Elijah admitted that he had no intention of letting us survive, but our rolls were so strong that Dave and I simply could not be stopped. To continue the tale, Elijah and I envisioned the king asking the brothers to go to the eleven other Labyrinths, that were scattered amongst the land, and slay the other Minotaurs before they could release their fury upon the world. So stay tuned for another adventure in the Maze of the Minotaur!